If someone complied all the styles of yoga being practiced, past and present, including the off-shoots and the emerging school of thoughts then the list would be unending. Truth is, there are so many sub-cultures within the culture of yoga itself that it is hard to decide on the standards. Hence, it is important that everyone accept the differences of each type of styles that has a specific emphasis. That being said, it is also important that you wear different types of clothing to the various yoga classes. If you think that sticking to a specific type of clothing will do you any good, then that is wrong. Hence, find out in the blog, the different types of yoga and the clothing required to wear by one the collection of which you can find at clothing manufacturers in Las Vegas. Yoga practiced in heated rooms are designed specifically to make you sweat like buckets. Hence, in this case don't torture yourself by wearing such clothes that are made of cotton or other thick material that will further increase the body temperature. In this case, all you need to do is wear as much minimal clothes as possible. In fact, stick to moisture wicking clothes that will help to keep the body temperature balanced. Ashtanga Yoga is an austere practice that requires you to do a lot of movements in many different ways. 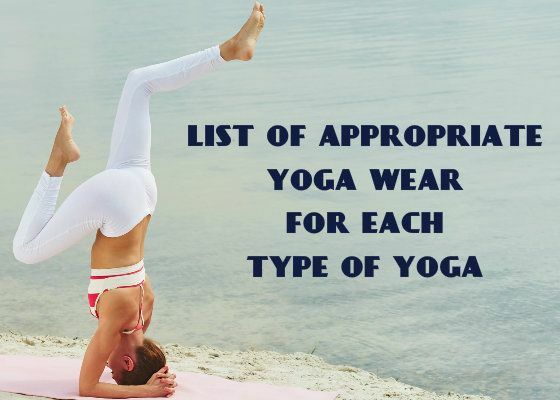 But the best of doing this yoga is that you'll get to know about the sequence of postures you have to do according to which you can determine the type of clothing that you have to wear. There will be many poses wherein you have to lift up your legs, thus requiring you to wear half-pants. Thus, flexible clothing is a top criterion when it comes to doing Ashtanga Yoga. There are types of yoga that put more focus on the meditation factor than the whole aspect of movements or at least maintain a balance between the two. In Kundalini Yoga you may move around a lot, but it will not be that strenuous in nature. For such peaceful yoga session all you need is light clothes that will provide you with the outmost comfort. Hence you can wear free-flowing clothes like a light fitted capri and loose tank top. There are some types of yoga that does not follow any said sequence. There will be chances of all different types of movement at any given point of time. In the Vinyasa classes you'll be asked to do a lot of poses like twists, inversions, backbends or standing balancing poses. Even though these poses are fairly flexible, in spite of that you'll be required to wear such clothes that will stick to your skin, like the compression wear. Retailers can get in touch with Las Vegas wholesale clothing manufacturers and browse through the assortment of exclusive yoga clothing pieces. After selecting the required pieces, state the bulk needs to the customer care team.